Aida Be­gić is a Bosnian Muslimah, and director of the film Snijeg or 'Snow' which opened up the 14th Sarajevo Film Festival (SFF) in August 2008. It won the 2008 Cannes Critics’ Week Grand Prize, as well as being screened at film festivals around the world. You can read a Q&A with Aida about her film here. Aida graduated from the Sarajevo Academy of Performing Arts in 2000 where she now teaches directing. In 2003 she founded an independent production company Mamafilm together with Elma Tataragić and Snow is their first feature film. On a separate note, I totally adore Aida's pretty hijab style! Any other budding Muslimah film directors out there? as a matter of fact, I am one of those aspiring Muslim(ah) filmmaker. I have made two short films for a competition in Singapore and I would certainly love to do more. Insyallah, I'll be pursuing a degree in filmmaking after getting hold of my A level results come next month. till then, I shall leave a link to my short film here. She's so cute, masha'Allah! I love the bottom middle. Pretty scarf and pretty way of wrapping it. Good luck, Sharmee! :) The video you posted is really good, mA. I too love this style and would like some advise on how to wrap it. ...especially like the fuchia one. It looks like you wrap it turban style, then around the neck. Anyone have ideas? Congrats to her on her great work. Hope to see her film. Thank you for puting up this entry. 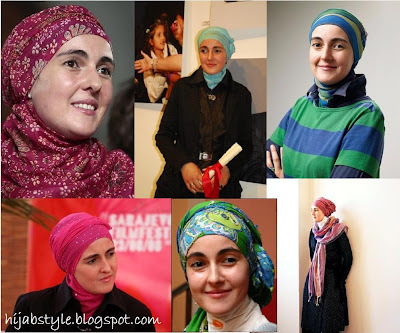 I love her hijab style and I am also excited knowing one more artistic Muslimah! I wish I can watch her film. Thanks for this face,I'm also bosnian muslima. I want to know how she wrapped the fushia hijab too! now does not fall to cover the hill, but for every beast to leave it’s trail.” Eastern Bosnia, 1997. Six women, a grandfather, four girls and a young boy live in war ravaged and isolated village of Slavno. Their families and friends had been killed and their bodies had never been found. The first snow brings full isolation and risk for life in the village. It gets closer as villagers headed by Alma, a young stubborn woman who believes they can survive, tries to find their way out of poverty by selling plum jam and other fruits and vegetables their village is famous for on a deserted road. Two businessmen visit Slavno demanding residents to leave the village offering money in return. Villagers face a dilemma: should they accept the offer that could save their lives, but destroy their souls. A sudden storm traps the businessmen in Slavno, forcing t“hem to face a problem bigger than anything they expected – the truth! Alhamdulillah I'm a muslimah and alhamdulillah I'm a Bosnian muslimah. I am Indonesian Muslimah.... I am so proud to be Muslimah and I Love to know more Muslimah sisters whole the world!! And I am so Proud too knowing Aida is the most of Creative Muslimah! From Bosnia. Maybe any eithers Muslimah in outside there likes Her?? C'mon! To be Great Muslimah! And Sist Jana! I am so bless to know your Blogs! It is Helping me and many sisters in (Indonesia) and All countries to be Good to do As Hijabers!